Rise Up is a powerful track from the album Maktoob by Ilyas Mao, and it features rapper Muslim Belal and spoken word poet Boonaa Mohammed. Each artist has a unique style and thus the track spans three generes. There are no musical instruments used yet the song has a mainstream feel. All sounds are done by human voice only, which is important because Muslims are divided on the permissibly of musical instruments in Nasheed. Learn about the different opinions on Music in Islam. A song like this can only be a recipe for success, helping reach a wide audience without taking risks with the faith. The three artists bring their own unique style and character to the song, so let’s learn more about each one. Ilyas Mao is a Canadian singer, producer, writer and composer. He started out doing instrumental music and singing about topics that had no relation to his life or character. Ilyas then entered the world of Nasheed and claims to have achieved more than ever before. He has collaborated with famous Nasheed artists such as Maher Zain, and even has his own TV show on Eman Channel. Ilyas not only sings but composes music for tracks and various TV shows. The music is instrument free, composed by layering multiple human voice sounds and playing them back in harmony. Ilyas Mao composed and produced the song, and also sings the chorus. Muslim Belal is a rapper and actor from London, UK. His real name is Ashley Chin, that’s right… he converted to Islam. His conversion took place in 2001 at the age of 19. Since then he has given dawah to his Mother and Brother, who also embraced the faith. In a similar fashion to Ilyas, Muslim quit conventional rapping, dropped the beats and switched the focus to Islamic lyrics. With regards to his acting career, Muslim Belal has appeared in films such as Anuvahood, Victim, Starred Up and The Boxer. He even featured in episodes of the Bill, a well-known British TV show that ended in 2010. Muslim Belal travels the world telling his story of how he came to Islam. He often describes how he discovered Islam before discovering Muslims. In other words, he came to Islam because of it’s beauty rather than the actions of Muslim people in today’s society – and his part in the song is reflective of this. Muslim raps about the reality of life, and how people are quick to judge others before looking at their own actions. Boonaa Mohammed is a Canadian spoken word poet and writer. He has performed in various countries, and even won the Canadian Broadcasting Corporation poetry ‘Best New Artist’ award in 2007. His words are firm, strong and powerful; bringing to mind names such as Nelson Mandella and Malcom X. He encourages people to go against any system that teaches wrong and make a positive change. It’s a unique video with an interesting style. The setting, colour-grading and outfits are similar to what you would find in a rap video, only this one is different. 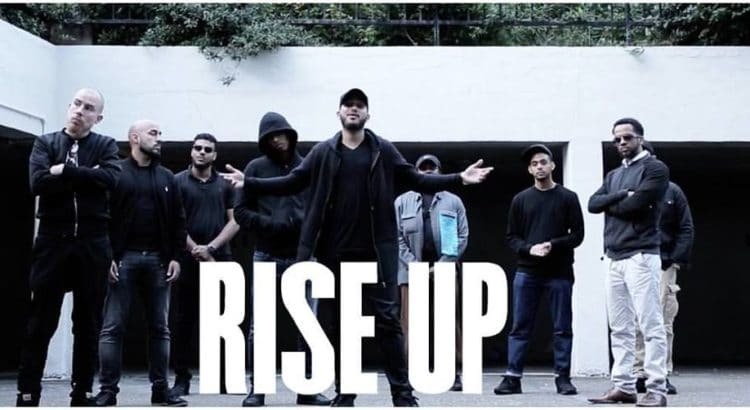 Rap videos often feature people dancing, pacing and moving quickly… however most of the ‘Rise Up’ characters are stood perfectly still. The singers were previously part of non-Islamic music and lifestyles. It could be that the characters in this video are thinking back to what they used to do, in a state of deep reflection. They are no longer keen to dance around or rap about negative things, as they have made a change – they have risen up! Boonaa’s part is particularly interesting. Photos of protests are presented during his entire segment. We see snaps from protests about black lives, racism and education. These pictures highly correlate to his powerful words. Try Amazon Music and listen to ‘Rise Up’ on your phone. Lyrics to ‘Rise Up’ by Ilyas Mao, Muslim Belal and Boonaa. 2 Should We Follow The Majoirty? There are hadith indicating that we should not sway from the view of the majority of Muslims, but what about the majority of people on earth? The Quran gives a clear verse on following the majority of people in the world, explaining that the majority will follow their desires rather than correct guidance. So let’s rise up to do good, even if the world teaches otherwise. Similar to the belief of other monotheistic religions, God created Adam, followed by Eve. We are Adam and Eve’s descendants, and therefore all part of one wider race. This line in the song helps setup for the coming verses about uniting and seeing past the colour of our skin. The media often portrays Islam as a violent religion, however the Quran and Hadith are against the idea of killing innocent people. Nasheed artist Safe Adam recently wrote a song against terrorism titled Not In My Name – have a listen (contains Music). Teaching the world to unite is not an easy task, it starts at home and within our communities and religion. There are many sects in Islam, but did you know that the Quran actually warns against diving the religion? The Quran constantly reminds us that the next life is much better than the one we are in. This world is not perfect by any measure. Micheal Jackson made a great point with his track “Man In The Mirror“, a point that is in-line with the Quran. We need to change ourselves before we can expect change from others. Everyone knows that we shouldn’t leave gaps in our rows during prayer, and that the row should be straight. If we create ragged rows, Allah fills our hearts with emnity towards each other. Sometimes we hear that the devil will join the Salah, and to this some scholars believe that the prophet was not talking about the actual devil but a metaphoric devil of hatred between each other. Whatever the case, it’s best to close the gaps and keep our lines straight. Muslim Belal connects his personal life to the song in this verse. When reading about the prophets of God, we find they were kind, humble and sincere people. Over 1400 years on and we are starting to deviate from their ways. Maybe this was bound to happen. It has been 1400 years after all… but we can try to bring things back to how they once were, by starting with ourselves. It’s a tough question that scholars debate. We are taught to obey those in authority and give them their rights, but if that authority goes against Islam we should stand up and side with Allah and his Messenger, while still giving them their rights. Clearly lots of hard work has gone into this track and it’s refreshing to see such a well-produced track with no music. The sound, message and video have been thought through in great detail, even though they are from different parts of the globe. I’m going to give this track a high rating, do you agree? Feel free to leave yours using the star system below.